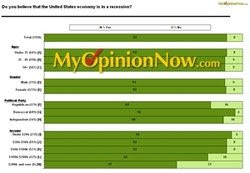 When 92% of Americans believe the United States economy is in a recession, then there really is something to worry about. According to a recent study based on 1,550 people across the country paint a frightful portrait of the distressed lives of families and individuals across the nation. Out of the 92% that say we're in a recession, a whopping 87% say the recession has negatively impacted the spending habits of them and their families, is noted on PRWeb.com. The process was noticed about six to nine months ago as the majority of these Americans say. This change impacted their spending habits. Findings emphasise the following aspects: nearly three out of four Americans polled in this study claim to be staying in more, dining out and personal shopping less often, and relying on coupons more. 50% of Americans are also shopping for groceries less often and shopping in bulk more, 35% are even shopping for basic necessities less. 46% of those polled are visiting their families less and 53% are vacationing less. According to the PRWeb.com 20% believe the three worst fiscal aspects of this recession are unemployment, home foreclosures, and government bailouts of the banking/finance industry; taking a toll on personal lives, these changes are causing businesses to struggle. 56% these Americans who are dining out less often claim to have noticed some of their favorite restaurants or stores go out of business within the past year. But there are some businesses that are thriving in spite of the recession. For example, since Americans are shopping in bulk more and hunting for better deals, large bulk retailers such as Wal-Mart and Costco remain recession-resilient. What are the prognoses? About one in five people have really hit rock bottom and have declared bankruptcy (or know someone who has) within the past year and 53% believe that the worst of the recession is yet to come. On a positive note, 47% believe that President Elect Barack Obama was the candidate that would have the most positive impact on our economy (only 28% said John McCain and 25% said neither).